A spicy superfood take on a game day classic perfect for your next party. 2Pierce each sweet potato with a fork multiple times. Place directly on oven rack that is positioned in the center of the oven. Bake for 55 minutes. 3While the potatoes are baking, prepare your toppings by first cooking the bacon (I used microwave method to make easiest). Next, move on to other toppings by cutting and mashing the avocado and chopping the green onion. 4Once the sweet potatoes have baked for 55 minutes, let them cool for 15 minutes and turn the oven up to 450 degrees. Once cooled enough, slice each potato in half – long ways. Scoop out about half of the inside of each potato half and place on lightly greased baking sheet. On each scooped half, top with a drizzle of hot sauce, a sprinkle of paprika and a sprinkle of chili flakes. (Amounts above are approximate to your preference). Place in oven for 15 minutes until skins come to a subtle crisp. 5Let the potato skins cool for 15 minutes. 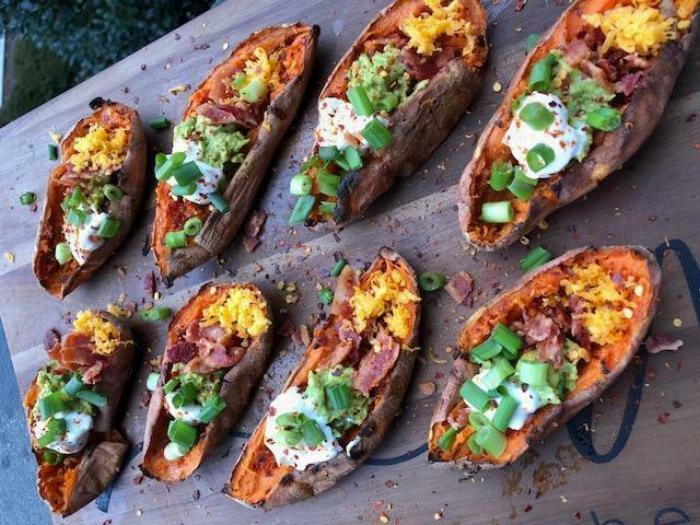 Top each off with avocado mash, plain greek yogurt, chopped bacon, green onion, cheddar and additional dashes of paprika and chili flake. Plain greek yogurt is a high protein/lower fat substitution for sour cream. Amounts of each topping may slightly vary depending on your taste and exact sweet potato size.